Yoga is derived from the Sanskrit word 'Yuj', which means 'union with' implying merging oneself with the real Self or the Divine. It is a distinct holistic philosophy that provides an effective path toward realizing the oneness in all human beings by combining physical postures, breathing exercises and meditation. Around 600 BCE, Sage Maharishi Patanjali described 8 limbs of yoga, called Ashtanga Yoga. Yama (Don'ts and Restraints: Non-violence, no lying, stealing, or hoarding, and sexual restraint). Yoga is a complete lifestyle dealing with the practical side of Indian philosophy. Yoga helps remove the veil that makes us think we are separate individuals and allows us to realize that we are one with the Whole, like the ocean waves that are one with the ocean. Yoga is much more than the physical exercises or stretching that are practiced in most of the yoga studios. Yoga is not just for relatively small concerns in life, such as how to cure obesity or diabetes, or how to be physically and mentally fit. It is also for the big picture - how to know the Truth about oneself and relate oneself to the universe. 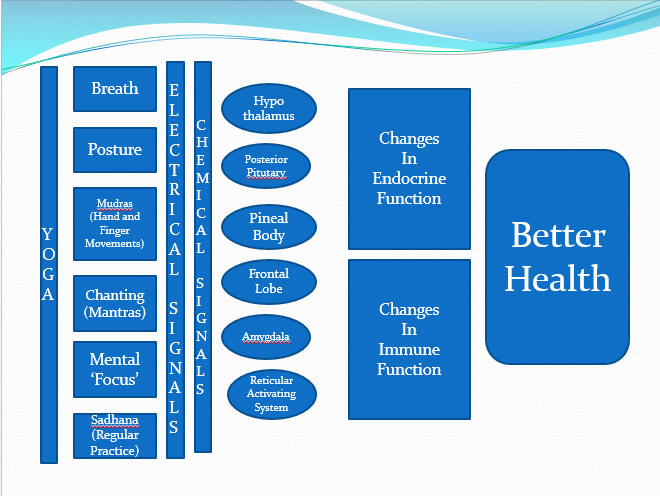 The practice of yoga benefits an individual in a number of ways that lead to good physical and mental health, as indicated in the schematic below. Yoga is a relaxed, yet powerful technique for relieving stress and tension because of its effects on body's muscles. It conditions the muscles and bones, extends the range of motion of the joints, and improves posture and body alignment, all of which lead to better regulation of physical movement. Motor skills, perception, and attention can be improved with specific asanas when performed properly. Yoga also aids weight loss efforts and improves metabolism. Additionally, some improvement in digestion, circulation, respiration, endocrine system (e.g., prolactin hormone), autonomic functions and certain neurological conditions can be achieved. Yoga can help control diabetes, hypertension, and obesity. One NCCIH-funded study of 90 people with chronic low-back pain found that the participants who practiced yoga recommended by the yoga expert Iyengar had significantly less disability, pain, and depression after 6 months. In a 2011 study, also funded by NCCIH, researchers compared yoga with conventional stretching exercises or following instructions in a self-care book in 228 adults with chronic low-back pain. The results showed that both yoga and stretching were more effective than instructions in a self-care book for improving function and reducing symptoms due to chronic low-back pain. Also, studies have been conducted suggesting that yoga practice (as well as other forms of regular exercise) might improve quality of life by reducing stress, lowering heart rate and blood pressure, helping relieve anxiety, depression and insomnia, thus improving overall physical fitness, strength, and flexibility. Sudarshan Kriya (SKY) uses specific cyclical, rhythmic patterns of breath to bring the mind and body into a relaxed, yet energized state. Its effects have been studied in open and randomized trials, both in healthy and health-compromised populations. Research suggests that SKY reduces depression, anxiety, post-traumatic stress Disorder (PTSD) and stress. It has also been shown to curb addictive behaviors and substance abuse. It significantly increases feelings of well-being, optimism, and mental focus and improves emotion regulation. In addition, SKY is associated with enhanced cardio-respiratory function, antioxidant status, and immune system function. The practice has even been shown to positively impact gene expression, suggesting that the effects of SKY span various levels of the physiology from the DNA to organ systems. Focusing on developing an awareness of physical movement can be beneficial for those suffering from psychological conditions such as depression and PTSD because an improved sense of connectedness between body and mind gives rise to enhanced control and understanding of their "inner sensations" and state of well-being. Mindfulness therapy seems to help veterans cope with PTSD, and it encourages those suffering from PTSD not to avoid disturbing thoughts, feelings, and experiences, but rather to accept them and put them in proper perspective. Mindfulness-based stress reduction teaches individuals to attend to the present moment, to attend to what they are experiencing - their thoughts, their feelings - in a nonjudgmental, accepting manner. As mindfulness skills increase, patients show improvement in PTSD symptoms such as nightmares, flashbacks of the traumatic event and avoiding things that might remind them of the traumatic event. In addition, patients experience improvements in irritability, depression and quality of life. Most people's breathing is shallow, utilizing less than 1/3 of their lung capacity. Proper yogic breathing helps utilize more of the lung capacity; deep inhalation helps energize the body and proper exhalation can help remove some toxins from the body. Breathing techniques like pranayama (Kapalabhati and Anulom Vilom, in particular) have some anti-aging properties and promote longevity. A verse in the Rig Veda states that oxygen is the ultimate medicine. It is like fire i.e., knowledge, brightness, and light. For all living forms, breathing is fundamental (Pran Tatva). It is almighty, it is energy and it is the life force. It is believed that disease can enter if the life force is weak. But if you make yoga your life partner you can take control of some diseases rooted in today's life-styles. Some of the challenges of creating medical literature are consistency in the technique of yoga and measuring the outcomes. Those of us who have been practicing yoga for many years "know that yoga works", but to prove it scientifically is difficult. In a way, Science is the highest authority in our world today; and yet what is science? It is concerned only with what can be measured 'objectively'. If the hemoglobin increases during pranayama, it is a quantitative measurement and is scientific. But if an individual claims to feel better after a yoga session, the feeling is a subjective piece of information and is considered unscientific unless it can be quantified in some way. Patanjali Yogpeeth and others have embarked on a challenging mission committed to getting yoga accepted internationally as a medical science. Acharya Balkrishna, an Ayurveda expert, is also working through clinical trials with the help of modern technology towards scientific evidence. Yoga Research Foundation at Patanjali University, working in collaboration with prestigious institutions like Harvard and Oxford are investigating the physiological and mental effects of Kapalabhati. Initial results are encouraging: Motor skills, perception, and attention had significantly improved after Kapalabhati. The National Center for Complementary and Alternative Medicine found that hatha yoga was the sixth most commonly used alternative therapy in the United States with about 8 % of the population participating. Therefore, it behooves a practicing physician to learn about Yoga and its complementary sibling, Ayurveda. Ayurvedic medicine evolved in India as the oldest holistic medical system in the world. "Ayurveda" combines the Sanskrit words Ayur (life) and Veda (science or knowledge). Ayurveda expression of health is dynamic living. Being in a state of health means being in a state of balance, physically, mentally and emotionally. Ayurvedic medicine adherents strive to create harmony between the body, mind, and spirit, maintaining that this balance prevents illness, treats acute conditions, and contributes to a healthier life. In the United States, Ayurveda is considered a complementary healthcare option, with many Americans employing Ayurvedic elements such as massage, meditation, or cleansing therapies. Key concepts of Ayurvedic medicine include universal interconnectedness (among people, their health, and the universe), the body's constitution (prakriti), and life forces (dosha). Using these concepts, Ayurvedic physicians can prescribe individualized treatments, including compounds of herbs or proprietary ingredients, including diet, exercise, massage, cleansing techniques and lifestyle recommendations. Scientists at the National Institute of Mental Health and Neurosciences, (NIMHANS) in Bangalore, have been asking four clinical questions about yoga: how does yoga affect cognition in patients with depression, what neurochemical alterations can the practice of yoga cause, how does yoga affect cognition in healthy seniors, and how does it affect dementia? NIMHANS researchers have found that impaired cognition in depression patients can become normalized after they practice yoga for a few months. In another randomized trial, healthy senior citizens were given neuro-psychological tests, and after six months of yoga their cognition improved. Researchers have studied Ayurvedic approaches for schizophrenia and for diabetes; however, scientific evidence for its effectiveness for these diseases is inconclusive. Ayurvedic practitioners often use turmeric for inflammatory conditions, among other disorders. Although research is limited, evidence from clinical trials shows that turmeric may help with certain digestive disorders and arthritis. Varieties of Boswellia (Boswellia serrata, Boswellia carterii, also known as frankincense) produce a resin that has shown anti-inflammatory and immune system effects in laboratory studies. A 2011 preliminary clinical trial found that osteoarthritis patients receiving a compound derived from B. Serrata gum resin had greater decreases in pain compared to patients receiving a placebo. Health is not only about waking up in the morning and feeling well. It's about managing stress, moving effortlessly and the countless small things we can do to take care of both our body and our mind. It's also about eating well and maintaining healthy relationships with family and friends. Along with other forms of exercises, Yoga can also improve life. Yoga can also improve life for people even in the absence of disease. Yoga is generally of low-impact and relatively safe and the risk of serious injury from yoga is quite low if sensible precautions are taken and practiced appropriately under the guidance of a well-trained instructor. Sthiram Sukham Asanam means postures should be steady and enjoyable, i.e., with effort but without a struggle. Modifications can then be made using props, altering the duration or poses etc. and beginners should avoid advanced moves. Hatha Yoga should not be combined with psychoactive drug use, and competitive Hatha Yoga should be avoided. If Hatha Yoga is used as a treatment, patients should inform the teacher of their physical limitations and concerns. Functional limitations should be taken into consideration. To ensure coordinated and safe care it is important to share information with one's health care providers about any complementary health approaches in use Women who are pregnant and people with certain medical conditions, such as high blood pressure, glaucoma (a condition in which fluid pressure within the eye slowly increases and may damage the optic nerve), and sciatica (pain, weakness, numbness or tingling that may extend from the lower back to the calf, foot, or even the toes), should modify or avoid certain yoga poses. Yoga is now part of the worldwide culture and two avenues are suggested to reach the whole society. "Almost everyone visits his/her doctor and everyone goes through school. If the doctor would advise yoga to patients, and if we could train every child in school, recommend yoga would be fully accepted as a daily routine, as is brushing the teeth. Yet both healthcare and education, need evidence that yoga is worthwhile and, therefore, we need continued research. A grim picture of the state of teenagers is often painted- many experience violence, problems with social skills, bullying, attention deficit, binge drinking, suicide attempts etc. Teens require assistance and one answer may be: Yoga in the school curriculum. Including yama and niyama (the virtues of external and internal purity) into yoga, the benefits would be greater. Indeed, life without ​Yoga ​ is like an unsharpened pencil - it has no point. With a multidimensional practice of Yoga there is increased peace of mind, clarity, alertness, and concentration. There may be increased ability to effectively deal with short and long-term stresses, improve self-esteem and decrease reliance on drugs. Meditation is a component of yoga. Meditation is more a state of 'awareness of your inner being' than 'focusing'; it is a 'conscious state of zero thinking'. Yoga can give us a proper understanding of our Self, the Spirit in us. It allows us to see a Divine Presence in ourselves as we begin to experience oneness with everyone. This can help bring fulfillment and unconditional inner joy, and hopefully a meaningful purpose in our lives. It is out of this fulfillment that we are able to share our joy with others through service or Seva. Daily Sudarshan Kriya and Yoga Practices learned in Art of Living courses has been a precious gift that has changed my life. Worries, anxieties, and negative emotions do not have the same grip on me and they go away faster. I l​earned to keep company with myself and realized that being alone is different from feeling lonely. I now understand Tagore's verse that says: "Love is the only reality, and it is not a mere sentiment. It is the ultimate truth that lies at the heart of creation" I do Yoga postures, but I realize that it's the mind that's important to charge the body with cosmic energy. I try to turn my attention inward, bucking the temptations of the material world in pursuit of Self-realization. My journey into yoga has improved my health, strength and peace of mind and created a sense of calmness. I strongly recommend the Art of Living courses to my friends, family, and patients. Asanas and pranayama help purify and fine-tune the body and mind to become more transparent for the inner light. Devotion and surrender to that great power within us (Bhakti yog) are important for a yogic life. Devotion is the great unifier and the goal of yoga is union with that all-pervading Divine Presence. Yet to be able to feel devotion, one needs to learn and reflect on that great Presence (Jnana yog) and dedicate one's actions to it (Karma yog). This combination of knowledge, love and action is the yoga that Sri Krishna taught Arjuna in the Bhagavad Gita 5000 years ago. To summarize, Yoga is not merely asanas and pranayama. It is more than just stretches, poses and an elastic body getting into a pretzel. The ancient secrets of Yoga hold the key to unveiling a new dimension of life, one beyond body and mind. Yoga helps purify and fine-tune the body and mind to become more transparent for the inner light. The practice of Yoga can make a person healthy, peaceful, enthusiastic, happy, and potentially lead to Self- knowledge/Self-realization. May yoga, the science of personal communion with the Divine, spread in time to all men in all lands. I would like to end by saying a greeting used in Bali, Indonesia: "Om swasti rastu," which means, "May you be in the best of health: spiritually, physically, mentally and emotionally."